City of Vancouver has the highest property taxes in Canada and the Province of BC is proposing to substantially add to this burden. Property taxes are based on a mill rate. This is calculated by taking the total municipal budget and dividing it by the total assessed value of all properties in the class (such as residential). The mill rate will be low if property values are high. But then the mill rate is multiplied by the assessed value of the property to determine the property taxes paid. In the case of the City of Vancouver, the mill rate will be low because property assessed values are so high, but once this is multiplied out, based on MLS Benchmark detached prices, it is clear that Vancouver has the highest property taxes in Canada. The graph above shows the base rates plus the utilities that are part of the total property tax bill for most recent figures of 2017. Note that the graph has been updated to allow for Toronto’s 4 year averaging and phase-in formula which substantially reduces Toronto’s assessed values that are applicable to property tax calculations. June 13, 2018 update: The graph has been updated to reflect 2017 property tax data and the MLS Benchmark to reflect the typical July 2016 market value used for assessments. Property tax rates are still from the Altus Group Report (linked below). City of Vancouver benchmark is an average of the East and West side detached benchmarks as reported by the REBGV. City of Toronto benchmark is as reported by TREB. The Toronto-Central benchmark is an average of the benchmarks for the included neighbourhoods. Benchmark prices for Calgary, Edmonton, Montreal, Ottawa, Regina and Saskatoon are for each region as reported by CREA. May 29, 2018 update: To clarify, the Benchmark values are based on detached properties since that will be the most likely affected by the proposed surtax change, so is most relevant for that property type. Incorrect blog posts have been publishing inaccurate assumptions about Prof. Pavlov’s work. They have been notified of this, but at this time have yet to correct these incorrect assumptions. His detailed explanation is below in reference documents. 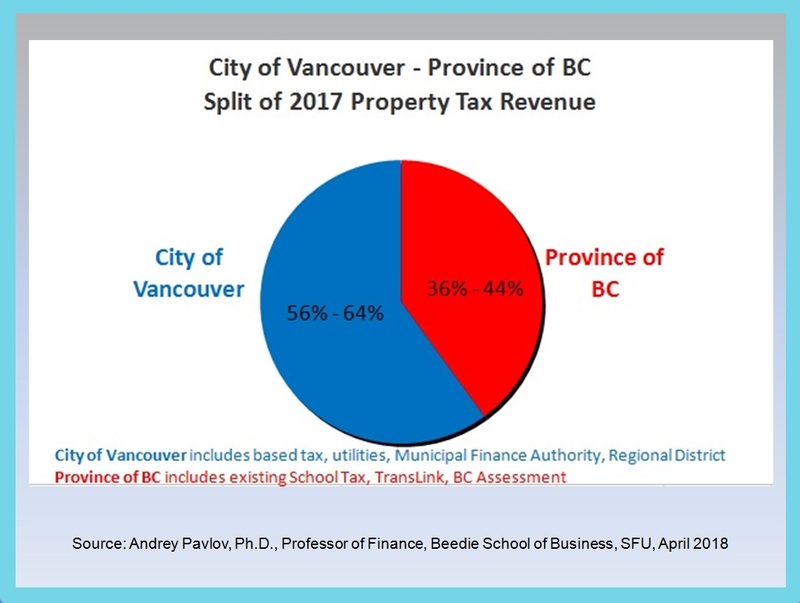 A further update May 15, 2018 below shows the breakdown of the split in Vancouver / BC portions of the property taxes collected. This has been then adapted to reflect the new “School Tax” property surcharge that shows how the province will be taking the vast majority of the property tax base if this tax is implemented. Clearly the Province of BC is proposing to substantially encroach on the municipal tax base if this surtax is implemented. All municipalities should be concerned. District of West Vancouver, Richmond and Surrey have already been talking to the Ministry of Finance. 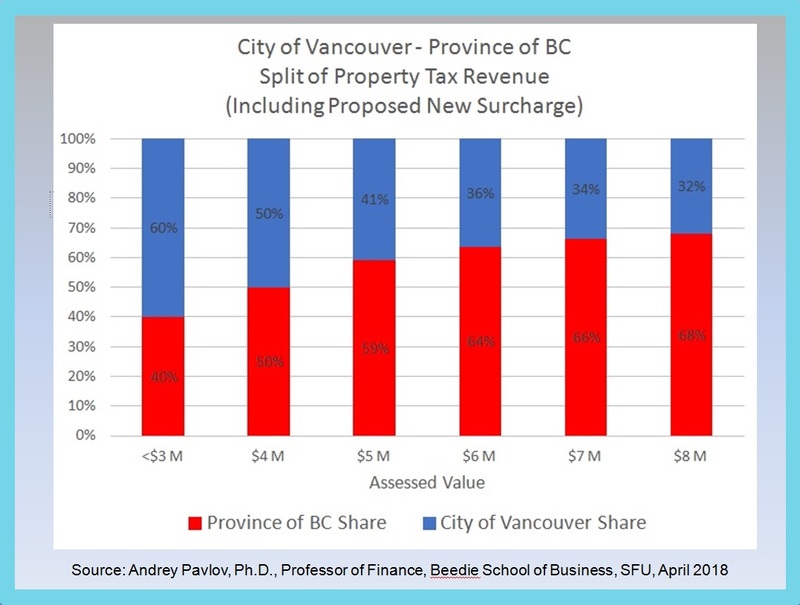 For BC to take this much of the property tax base will substantially limit municipalities’ ability to raise revenue to pay for civic infrastructure and services. Further update May 24, 2018 confirms that the City of Vancouver no longer does 3 year averaging of assessments for all residential properties. Now it is only targeted for “hot” properties. See links to Council reports below. 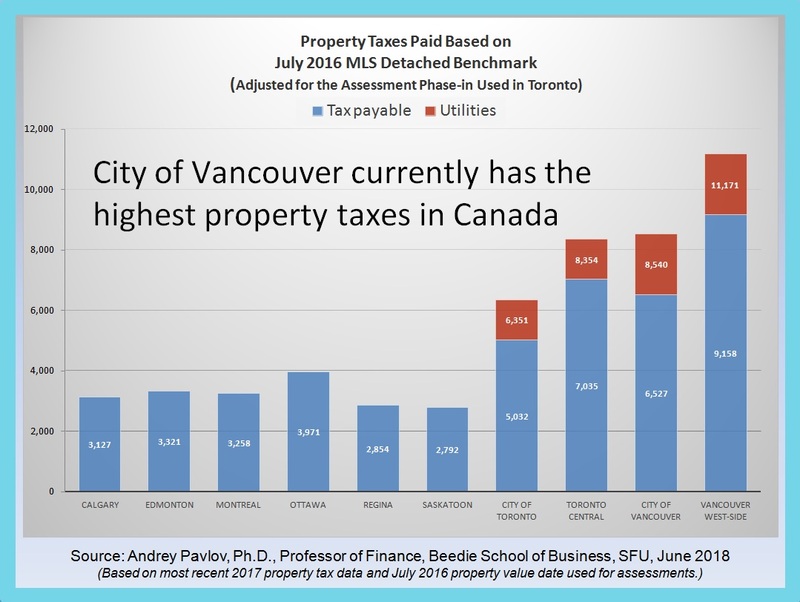 MLA David Eby’s webpage shows a graph that is not accurately portraying tax comparisons since it neglects to compare Benchmark property values in each city. Other cities across Canada have much lower property values than Vancouver and why the mill rate is so low, because the Vancouver property values are so high. The chart on David Eby’s website is therefore very misleading and inaccurate. This entry was posted in Elizabeth Murphy and tagged Affordable Housing, Chinatown, Community Plans, Elizabeth Murphy, Heritage, Vancouver. Bookmark the permalink.